What is Pyrite in Roofing Slate? Pyrite is iron sulphide (also known as “fool’s gold”) which is commonly found in roofing slates. Pyrite has an unfortunate reputation of rusting on the roof, but what many people don’t know is that you can have 2 types of pyrite inclusions; stable and unstable. A stable inclusion is found in a T1 slate. These inclusions tend to be visible flecks of “gold” with refined edges, typically a cube shape which, ironically, when found in its raw form, is really quite a beautiful thing. When on the roof, and exposed to the elements for a number of years, these inclusions, if anything, will rust as they are, without bleeding down the roof. These are completely harmless, they don’t discolour the slate and, most importantly, don’t affect the performance of the slate. 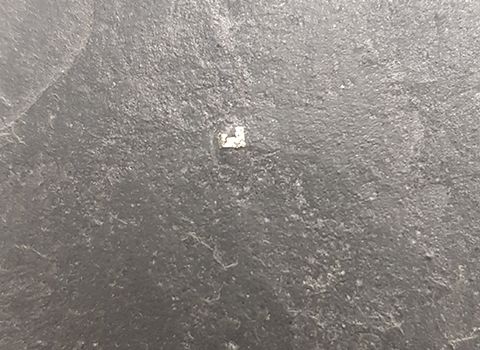 Unstable pyrite is sometimes very difficult to spot as the inclusions tend to be a lot smaller but greater in numbers, covering large areas of the roofing slates (see image below). 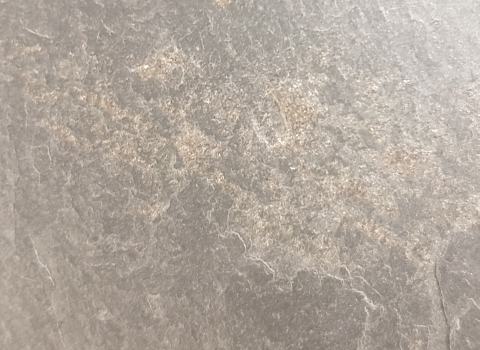 These inclusions are commonly found in T2 slates (something we refuse to stock here at Buy Roof Slate). While these inclusions very rarely compromise the performance of the slate, they do rust and bleed down the roof, creating a bit of an eye sore. We recommend checking the A1-S1-T1 DOP (declaration of performance) prior to making an order, to ensure you’re receiving a T1 slate. As stated above, not all pyrite is going to discolour the slate. A certified T1 slate is almost guaranteed not to rust, whereas a T2 slate can be prone to it. Again, we would ask anyone to remain cautious when buying slate with unknown origins and a DOP (declaration of performance). Here at Buy Roof Slate, we openly divulge all details of our slates, including their origin, to our customers. Your peace of mind and satisfaction is our number 1 priority. If you’d like to discuss this further with one of our knowledgeable staff, please don’t hesitate to get in touch. This entry was posted in FAQ by Ethan Martin. Bookmark the permalink.